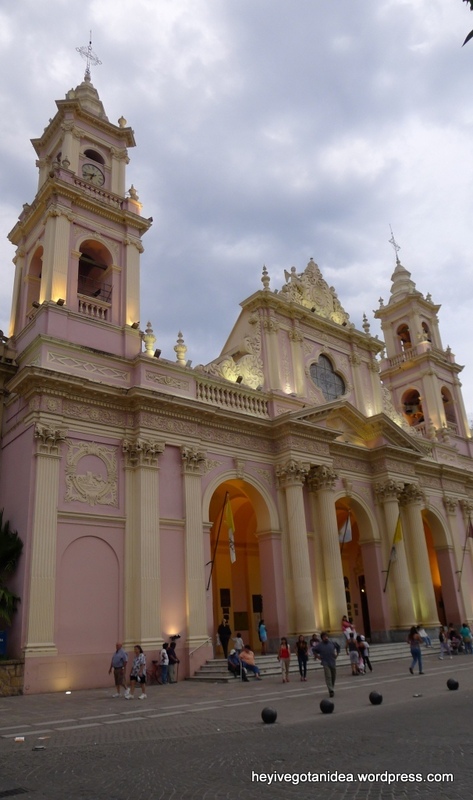 From Sucre we decided to head back into Argentina. 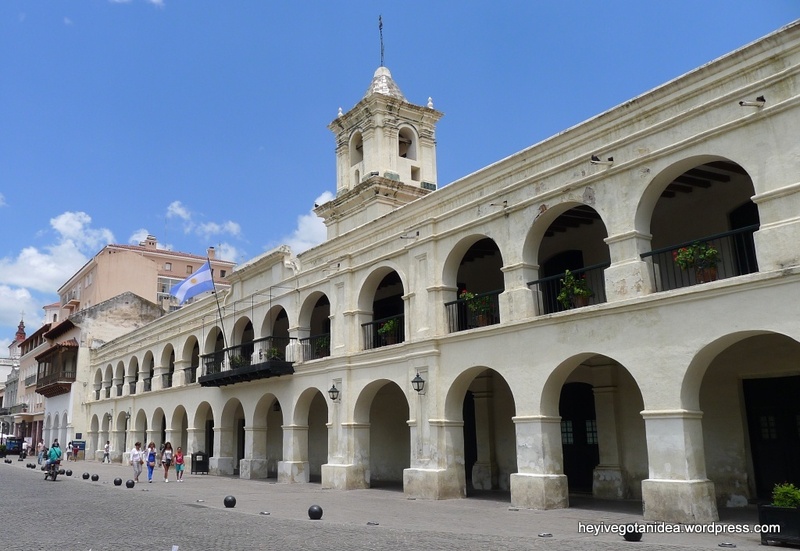 As we did not want to back-track along the same roads, we decided to take a different route and travel through the town of Tarija – this would also mean we could avoid using the border at Villazon which was unpleasant and super slow. 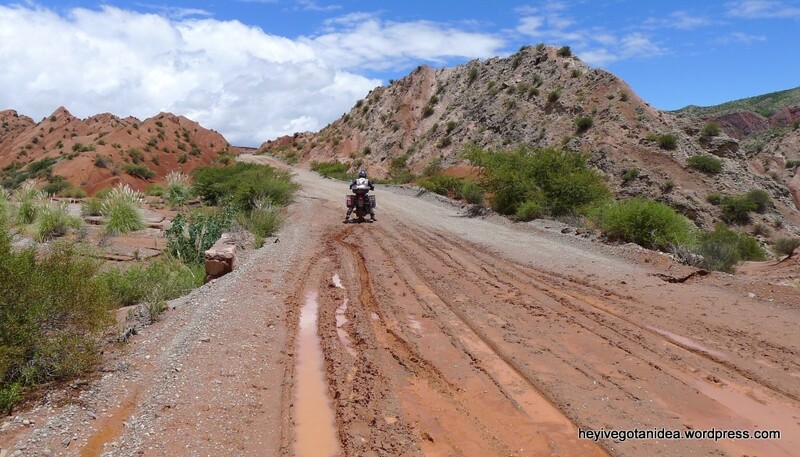 The roads in Bolivia were so much better than we expected, they seem to have paved a lot more of the major routes now so some of the horror stories about ridiculously long journeys are becoming a thing of the past – at least on the routes we took!! 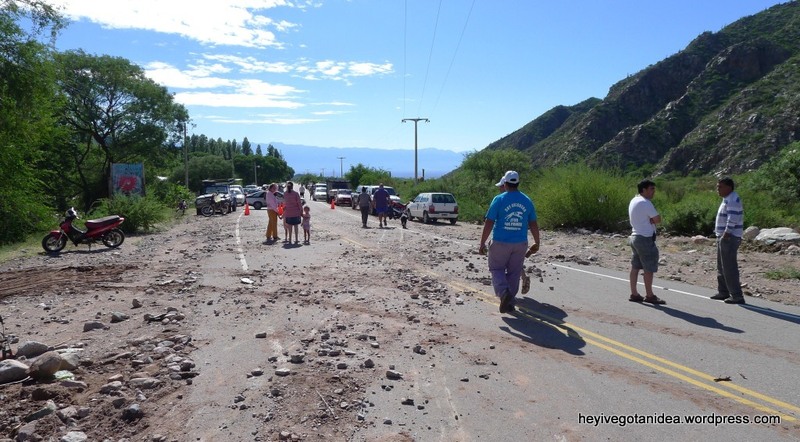 We did come across one stretch on the way to Tarija which hadn’t been quite finished – they were working on that though. 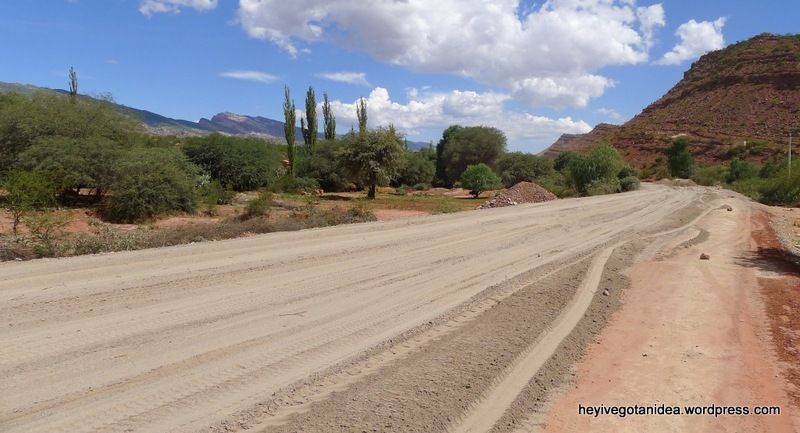 They had very kindly spread thick sand all over the road as part of their construction works…..thanks, bikes and thick sand are a great mix 🙂 Dan tried to ride along the side as much as possible….and we hoped this didn’t go on for miles!!! 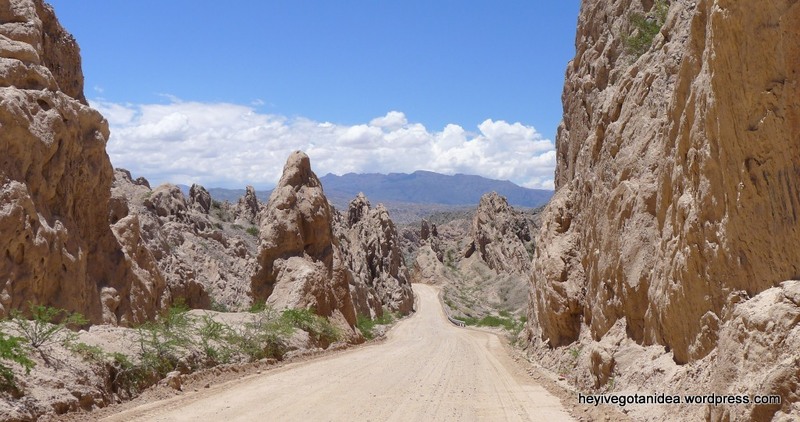 A new tunnel had also opened which reduced the travel time to Tarija….and it had stunning views on the other side! 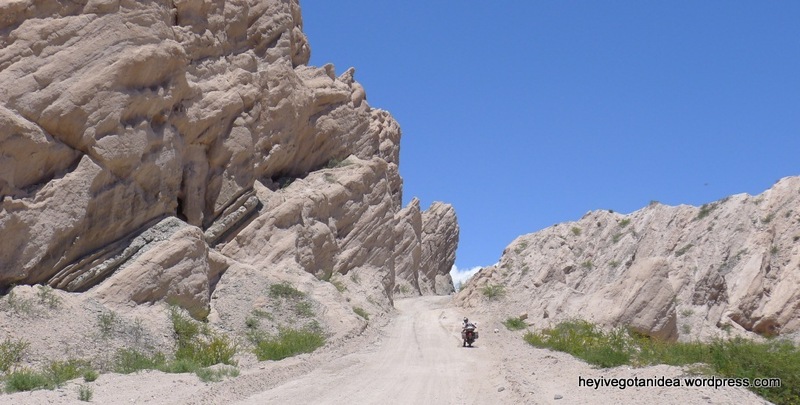 We had previously met a group of Canadian bikers when we first arrived in Bolivia who had taken this same route, but had problems buying gas in the town of Tarija. The had been refused at every station they tried and ended up having to get a local to go and fill up some cans so that they could fill up their 5 bikes!!! 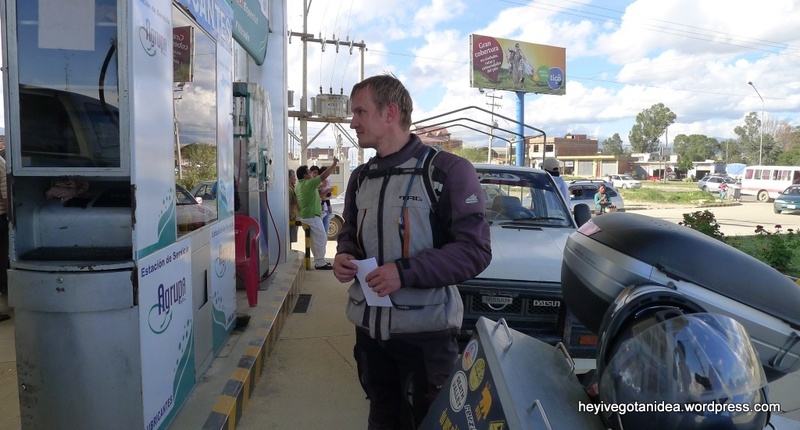 This had always been something I had worried about – the fuel situation in Bolivia is kind of strange. Foreign registered vehicles are supposed to pay 3 times the local rate per litre and should be given a special receipt. But for some reason some gas stations just refuse to serve a foreign registered vehicle. 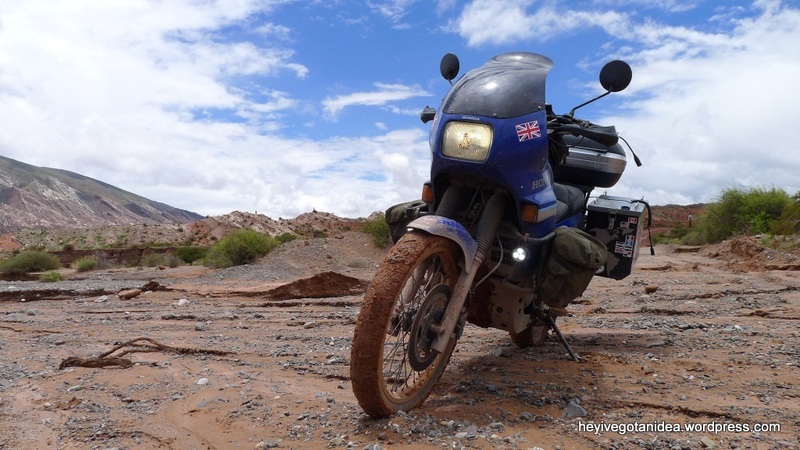 We had previously read some tips and advice on this website by some other overlanders who have done a good write up! 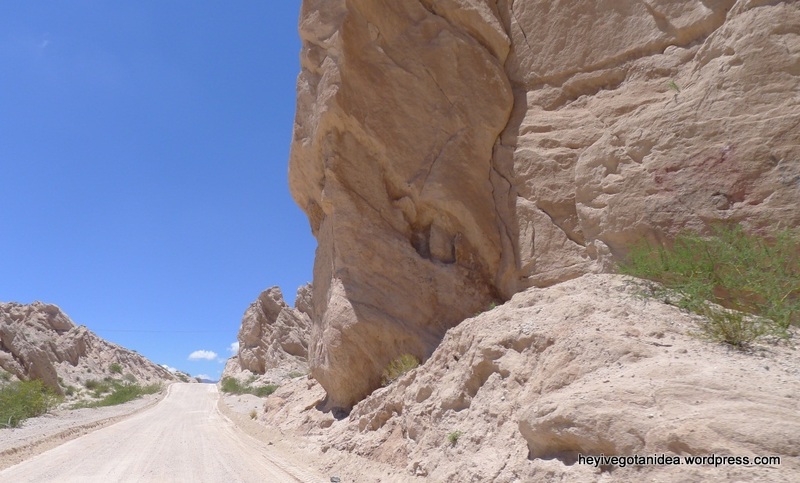 http://www.liferemotely.com/trip-shenanigans/bolivia/276-the-art-of-buying-gas-in-bolivia-. 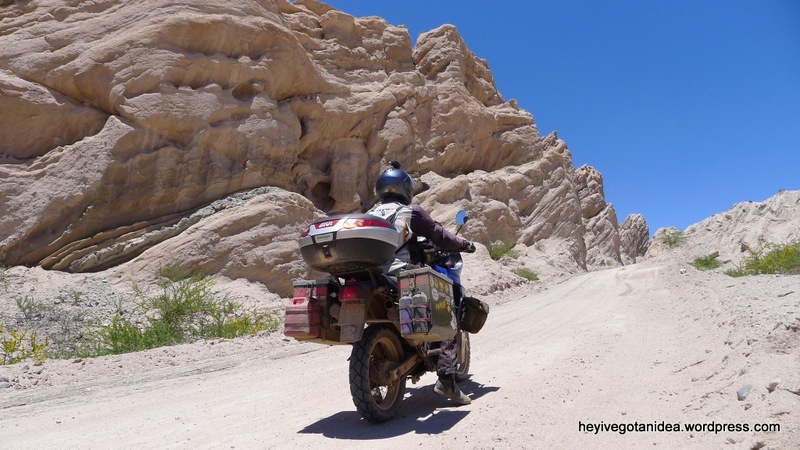 Our experiences of buying gas whilst traveling in Bolivia had ranged from sometimes paying the local price, sometimes paying the full tourist price and sometimes paying a rate somewhere in between after a bit a bartering. For some reason Tarija does seem to be one of the more difficult places and after being denied service at the first two places we tried, we did manage to get fuel on our third attempt!! Here’s Dan doing his best to try and get service after initially being refused – a queue started to form behind, people started to gather around us, we tried being super friendly and nice, then tried ignorance, then tried just not moving out of the way from the pump…..no joy here though – eventually we got bored and left!! 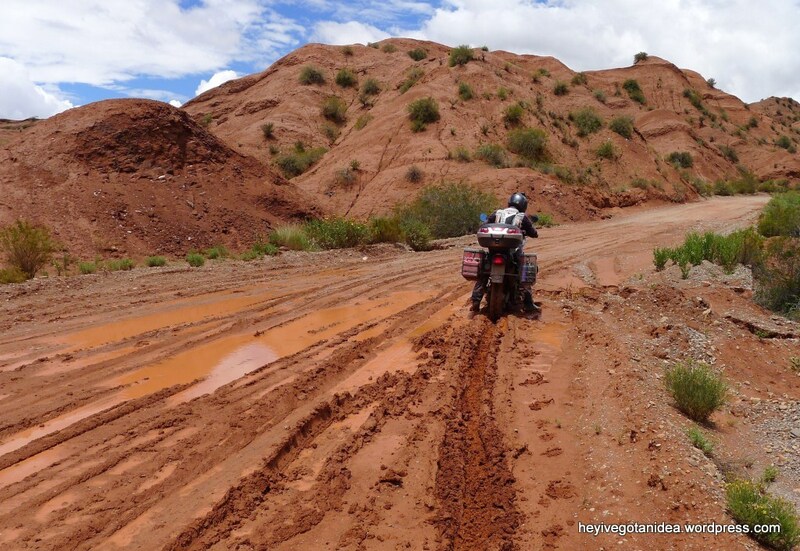 The next day we enjoyed our final ride through Bolivia on the way to the border….Bolivia had been amazing, and although we didn’t get to see everything we had planned, we had really enjoyed the places we visited. 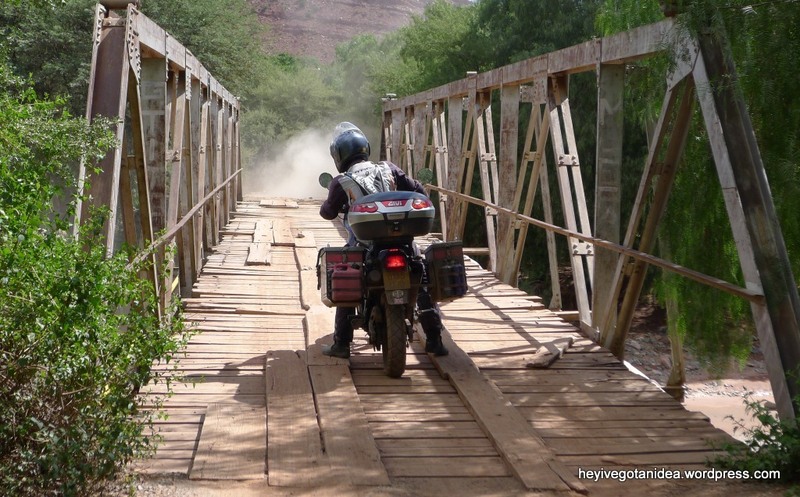 The ride to the border took us back down to a lower altitude as it twisted alongside a river….there were a few obstacles to avoid though – lots of fallen rocks and animals to avoid!! 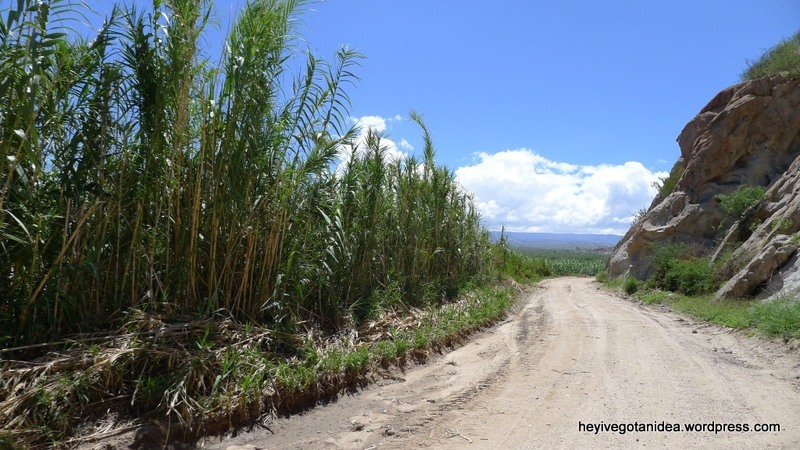 The border at Bermejo / Aguas Blancas was much quicker and easier so before we knew it we were back in Argentina. Most probably our last border crossing with the bike….woohoo 🙂 I dread to think how many hours of our lives we’ve spent in total at borders over the past 9 months!!! 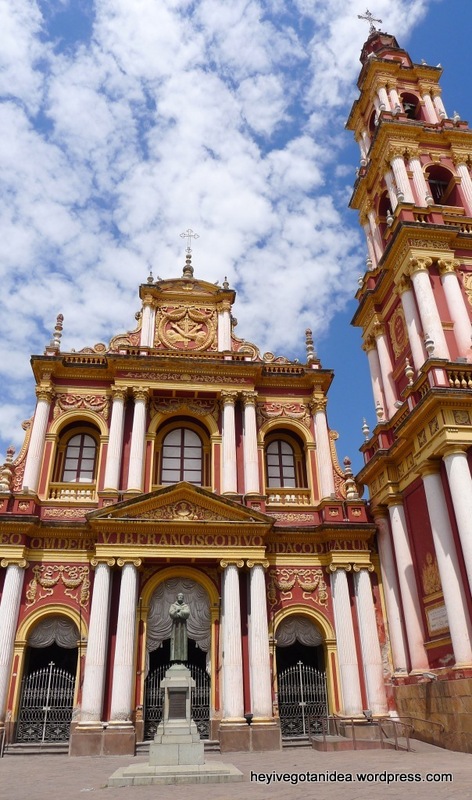 Our first stop was the picturesque town of Salta. 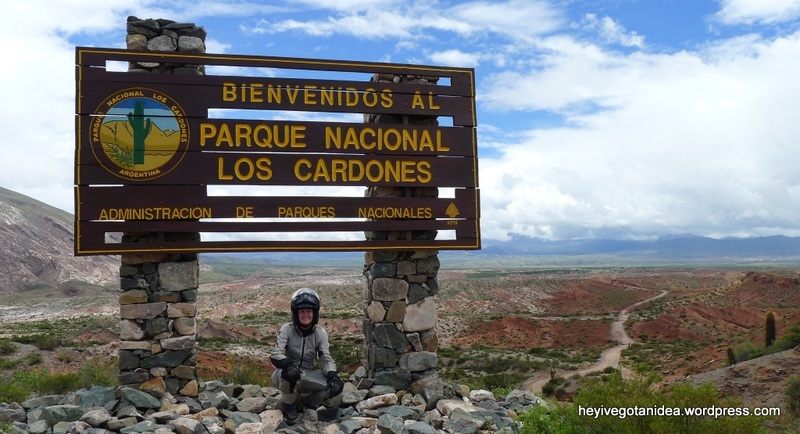 We decided to hang around for a few days and take in some sights whilst figuring out a route to take around Argentina. 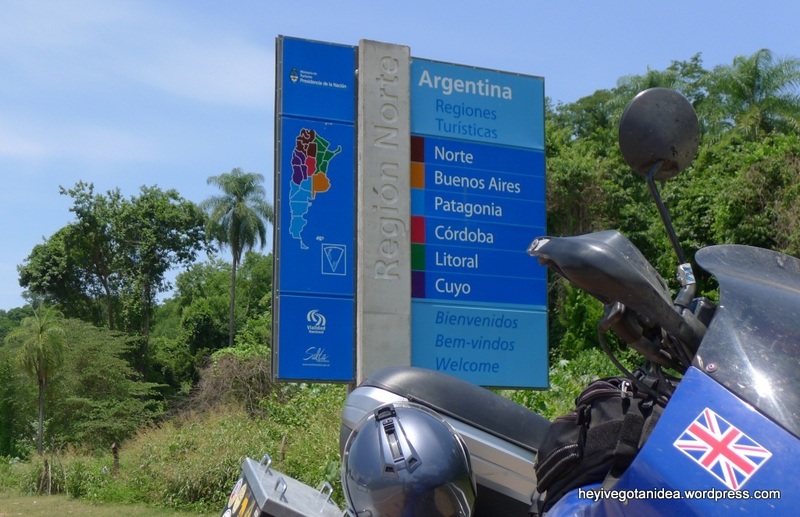 After reading some other blogs and information online, we decided the best route would be Ruta 40 down to North Patagonia. 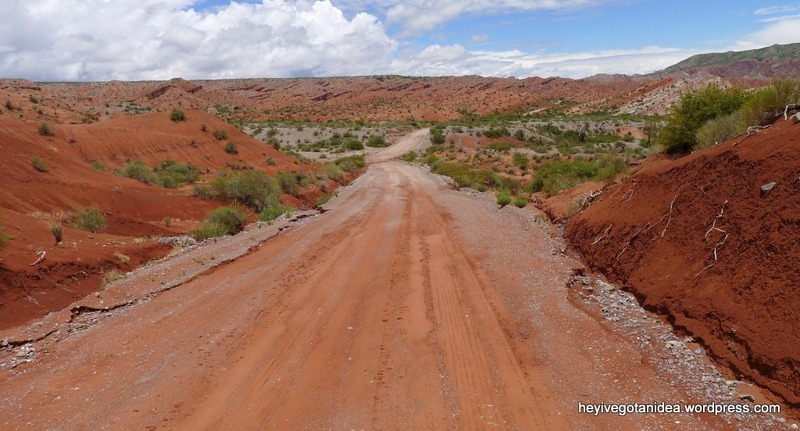 Ruta 40 is kind of Argentina’s version of Route 66 in the USA. 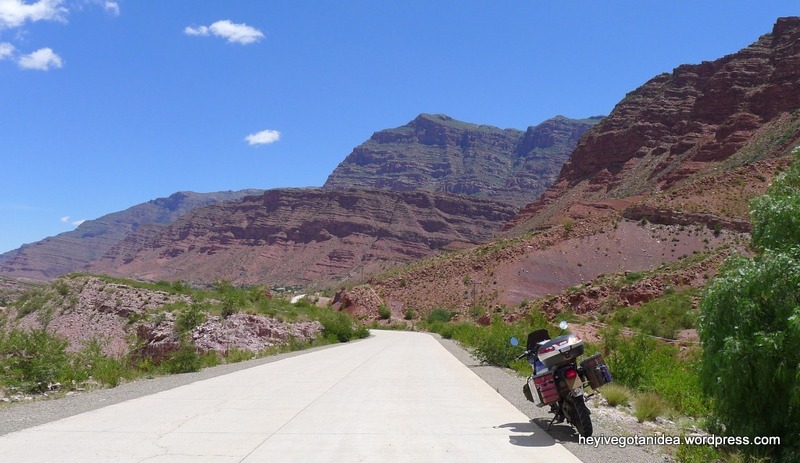 The more I read about Ruta 40, the more I loved the sound of it…..crossing through loads of national parks with spectacular scenery, we were in for a treat. 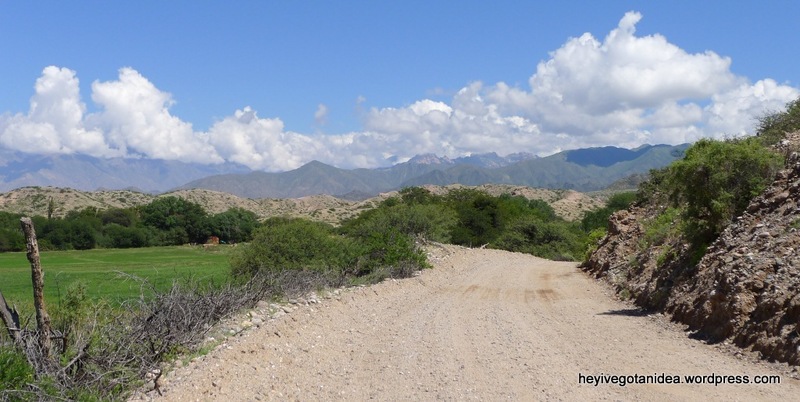 Before hitting Ruta 40, I had read about a route from Salta to the small town of Cachi which would take in another couple of amazing routes – we hit the road to ride Ruta 33 and 42. 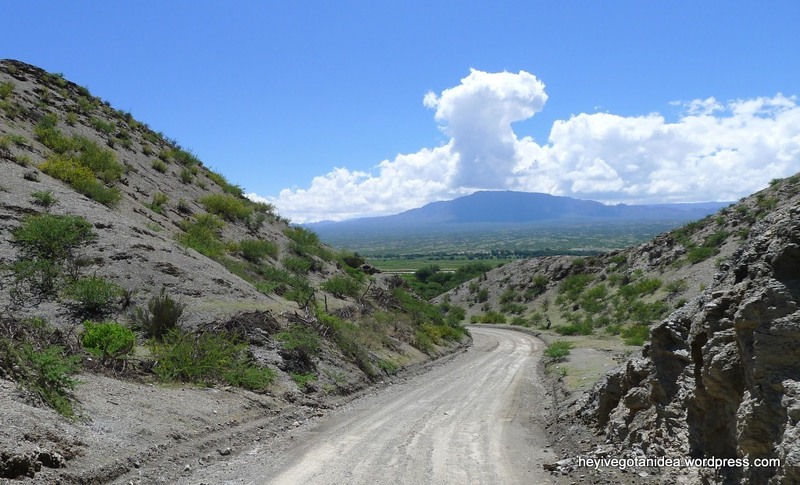 The day started off well with a mixture of tarmac and gravel…..along with great views. 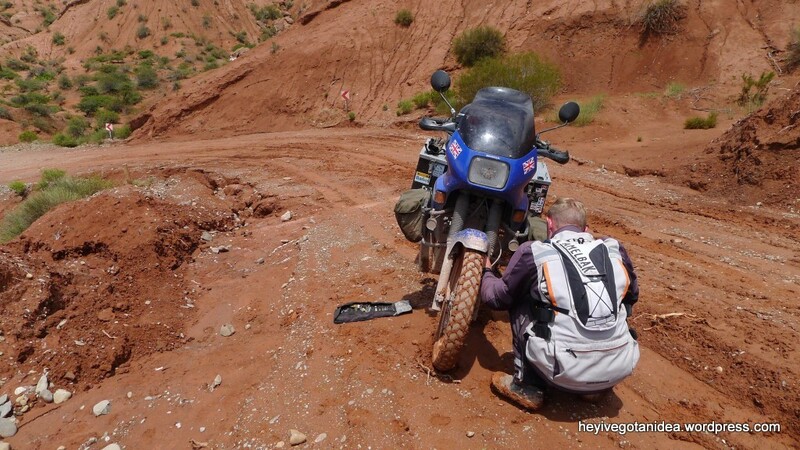 Then we hit Ruta 42, little did we know what we were in for!! 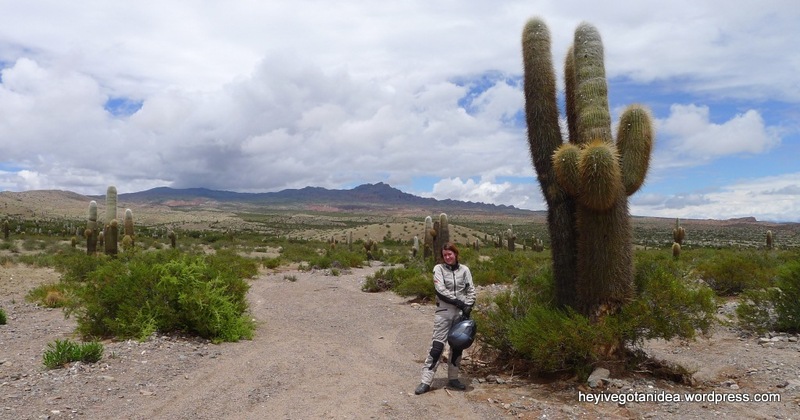 It all started off very civilized….nice gravel road and stopping to take photos with the cactus…..
Then things got interesting…….the nice gravel road was no more!!! 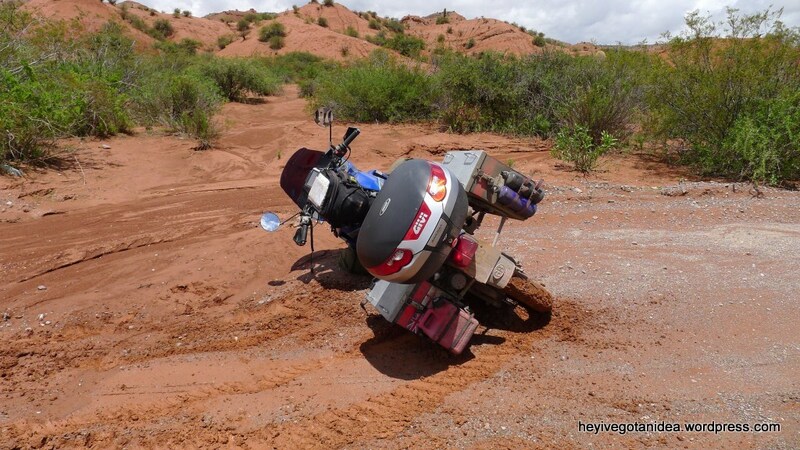 Riding in a straight line became a bit tough…. The wheels were now caked in the muddy, sandy, clay like red stuff!! 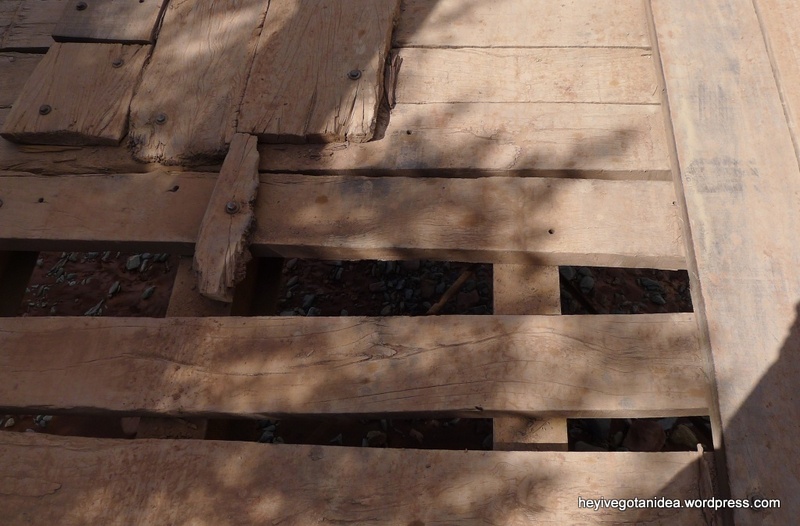 No tread anymore…. The answer to that is ‘a long time’!! 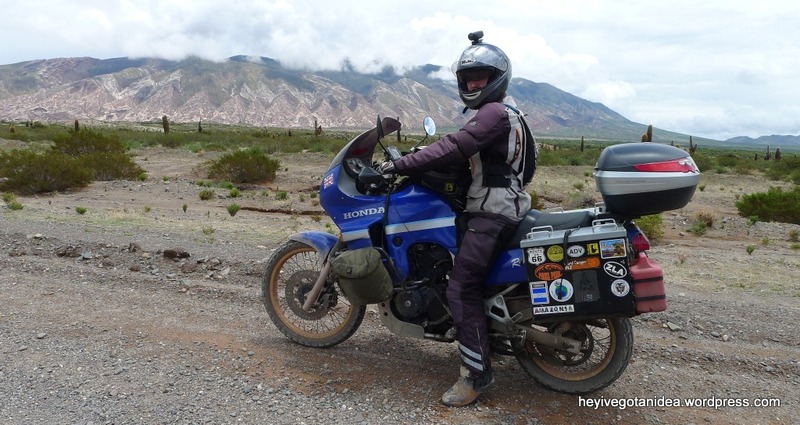 For the first time on this trip (apart from the stationary topple over in Nicaragua which we don’t count) the Transalp was on her side….only a very slow speed incident, but our first proper ‘off’ none the less. Having picked the bike back up, the Transalp and ourselves were now looking pretty dirty!! No harm done and we needed to get going….we were still not even half way along the road!! 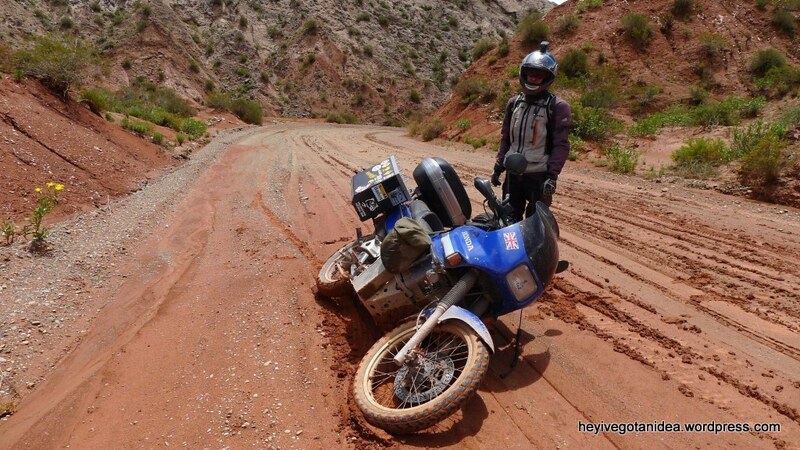 But then Dan realised why it was proving so hard to ride, yeah, the roads were bad – but the problem was that all the clay like mud stuff had clogged up under the front mud guard and the front wheel wasn’t moving. We managed to stay upright for the rest of the ride!! 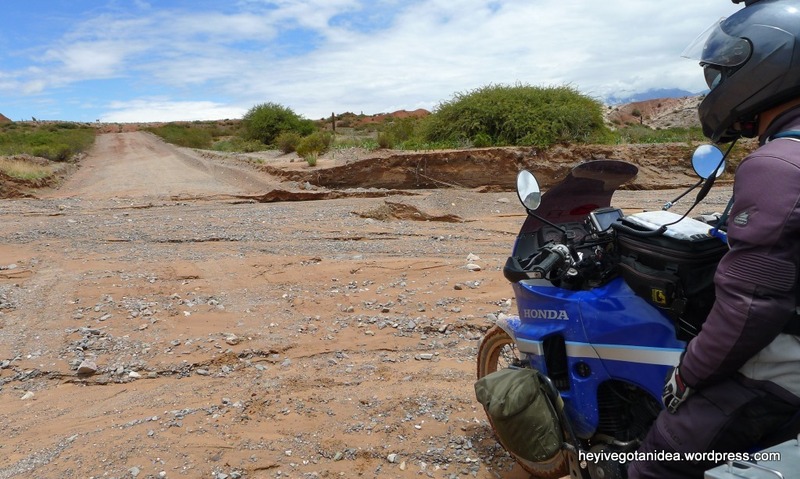 And eventually the nice gravel road did return….happy days!! 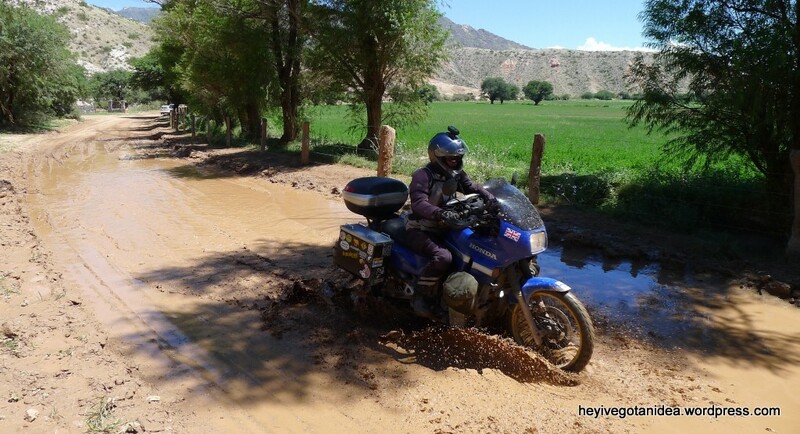 The next day was another day of off-road….but at least this was mostly dry and not muddy – with the mud guard re-fitted we hit the road on Ruta 40. It’s amazing how the scenery changed throughout the day….we took so many photos – the views were incredible! Time to take a break and relax! 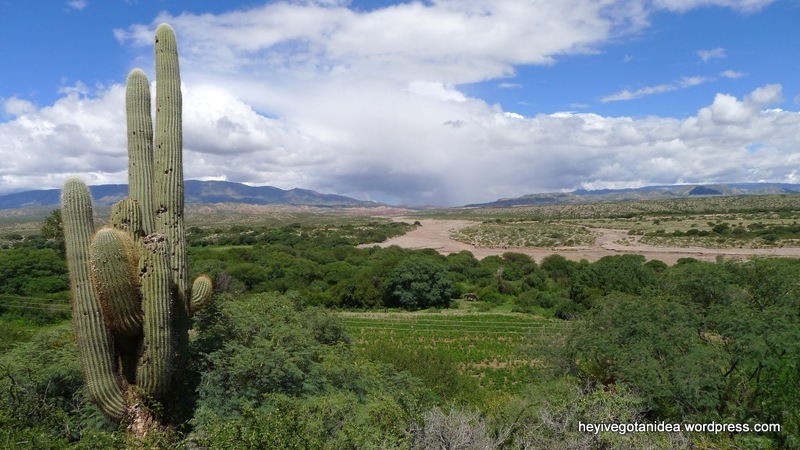 We spent the night in the town of Cafayate….a really nice tranquil little town – I could have stayed here longer. 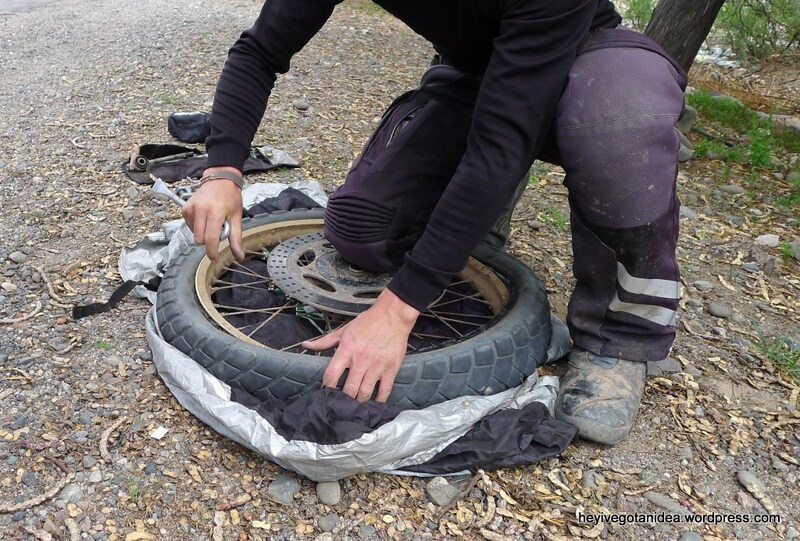 The next morning we headed for the town of Belen, a less exciting ride in terms of scenery and the roads were all paved….so an easier day for riding – apart from the fact we got a puncture!! Still it’s our first one since California back at the start of August so we shouldn’t complain really…. We were on our way again in no time. 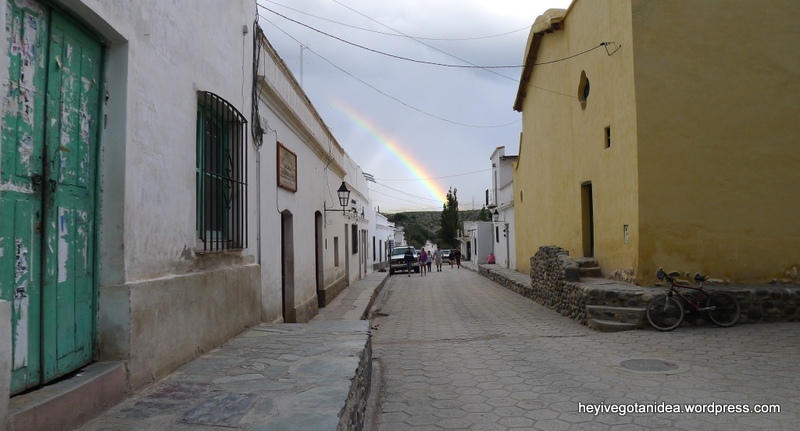 We spent the following night in the town of Chilecito after another easy day on nice tarmac roads. That night it rained….and it rained hard!! Maybe the most torrential rain I’ve ever experienced – the nice little guesthouse we were staying in developed several leaks in the roof as the rain was so intense!! 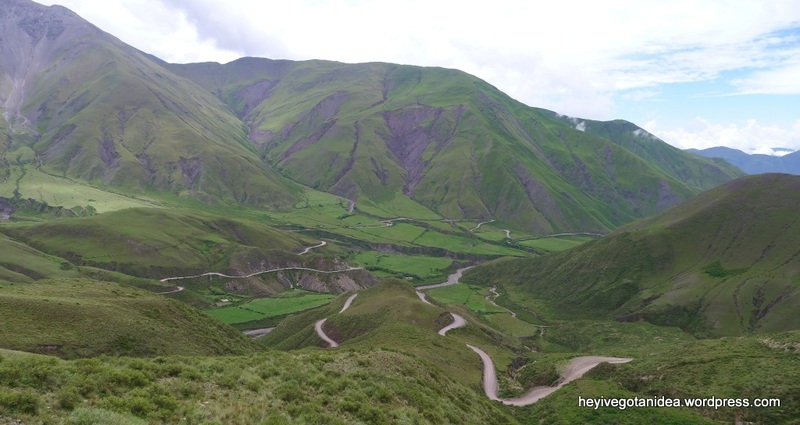 Our plans for the following day were hampered as we headed for the town of San Jaun via the mountains. 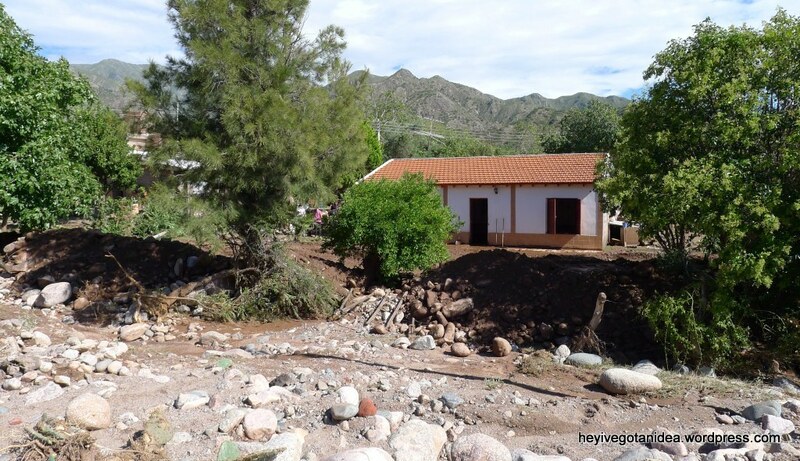 There was evidence everywhere of the amount of water that had fallen overnight – not because everything was flooded – the water had all subsided, but the rivers and streams had carved out new and deeper paths overnight. We barely recognised the road we had driven in on as a small stream had created a ledge and small cavern through the road. This was easily passed, but less than a hour into our journey we came across a road block. 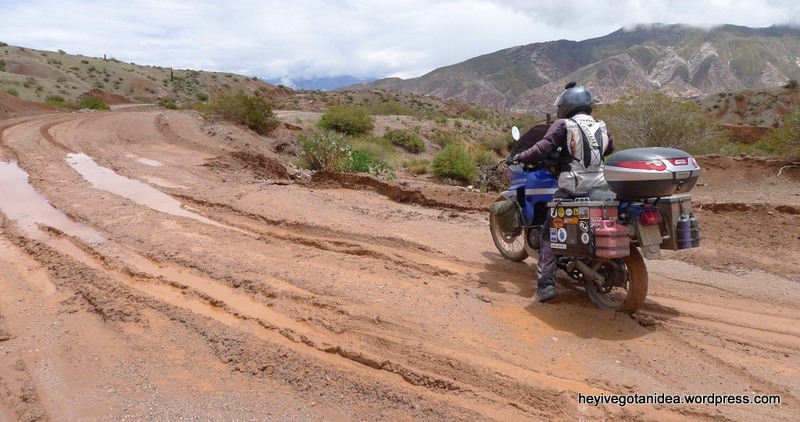 It seemed that the road ahead was not passable due to problems further along – probably a landslide I would imagine. And where we stopped you could see that a small (now non-existent) river had risen up and over the road and swept through a family home. There was evidence everywhere of the problems that must of occurred overnight – quite a few buses were abandoned / ground-out on the sides of the road….I was amazed that there was no sign of the water considering how much there must of been just a few hours before!! 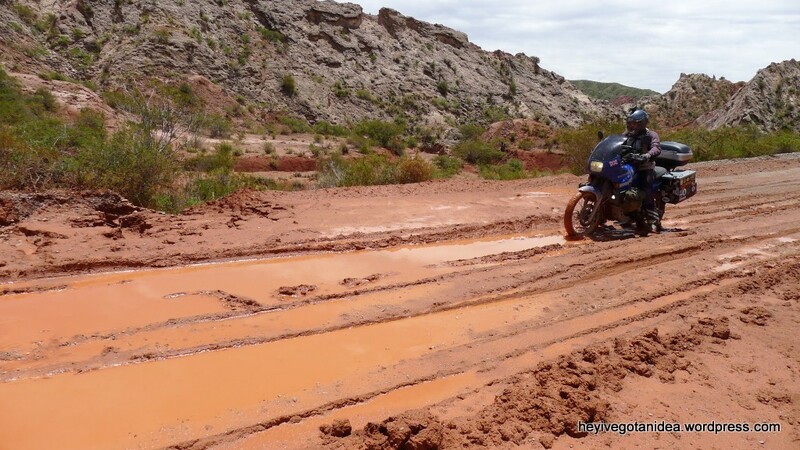 We had to take a different, longer, flat and unfortunately less interesting route, diverting from Ruta 40. Now…….off to get some wine!